“I wanted to make it big, that is why I formed my own car snatching gang. I was first arrested in 2017 after I fought an official of the Lagos State Transportation Agency, LASTMA, and was taken to the Ikoyi Prison where I spent one year and six months. I met one Lukmon who was living like a king in the prison. “Lukmon promised to buy me a bus anytime I deliver a snatched car to him. When I was released from prison I thought of the promise and how I would use the bus for commercial business. I accepted and I took guns to my friends at Alaba Rago. Before I went to prison, my friends-Sabastine, Rasaq and Hassan were into traffic robbery. We attacked motorists who were held up in traffic. When we identified a vehicle we believed the occupant had an expensive phone, jewelry or if we sighted a bag we believed could contain money, we would smash the glass of the vehicle and remove it. 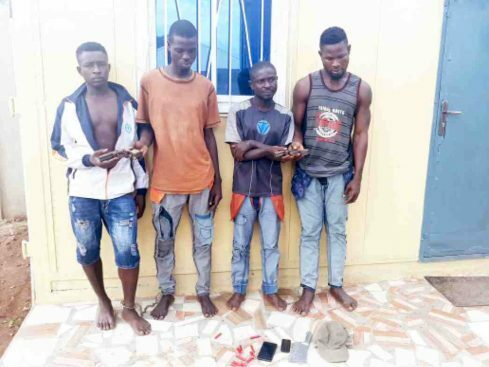 “We operated mainly at Volks and Iyano Oba Bus Stop along the Lagos-Badagry Expressway and we usually threatened our victims with sharp knives. The money we made from that business was too small, so I convinced my gang members to join me in car snatching. I told them that with guns and the contacts which Lukmon gave me, we could go into car theft. We had a meeting at Alaba Rago and we carried out our first robbery operation two days later at Igando area. I can’t remember the exact bus stop, but we were on a motorbike heading towards Ikotun Bus Stop and sighted a Toyota Corolla car and the owner was inside. I had one of the guns and Sabastian had the second one. We surrounded the car and forced the owner out of it. We zoomed off with the vehicle to Owolabi, Lukmon’s contact. We met him at Iyano-Sashi Bus Stop and after collecting the vehicle from us, he said we had to get him more vehicles because he would have to take the one we gave him to Benin Republic. He didn’t pay us any money. We went out the next day and snatched another vehicle at Okomiko Bus Stop. We accosted the owner in a traffic hold-up and took the vehicle from him. We handed it over to Owolabi and he also refused to pay us. My gang members thought we had a deal and they were angry with me. Each time I called him he would say he was yet to sell the vehicle in Benin Republic. “It was then I decided to pay a surprise visit to Benin Republic. While in Cotonu I discovered that most of the cars at the auto stand were stolen from Nigeria. They would refurbish the cars such the owners won’t even identify them as their own. Nigerians go to buy Tokunbo (fairly used) cars but end up buying stolen ones. Force Public Relations Officer, Moshood Jimoh who confirmed the arrest, said the IGP, Ibrahim Idris mandated Deputy Commissioner of Police (DCP) Abba Kyari to investigate and bring the culprits to book when he got information of the gang’s activities.